Despite the weather forecast promising us a very rainy weekend, nothing was going to deter us from heading out. Mum and Dad’s caravan was stocked with the essentials, mine and Tom’s cameras were packed, we all had our raincoats and gumboots, so off we set up the windy Parapara road towards Ruatiti Domain. Ruatiti Domain is a free campsite in the Ruapehu District. 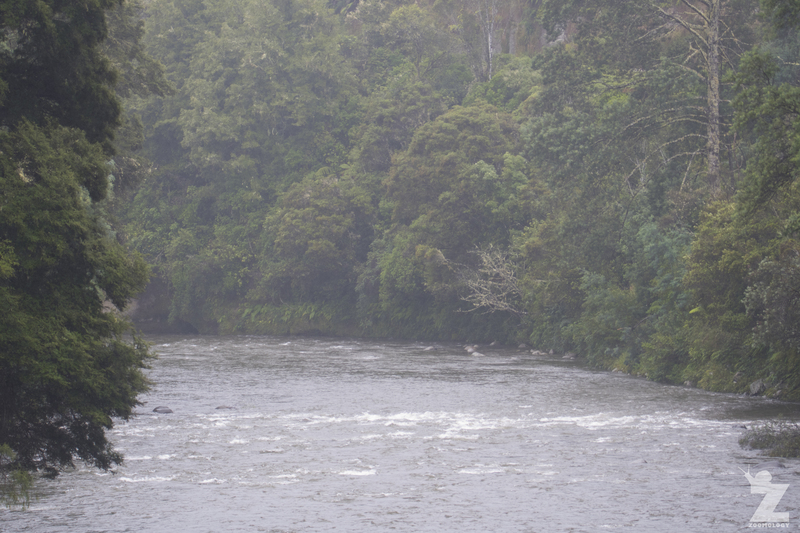 It lies at the confluence of the Manganui‑o‑te‑Ao River and the Ruatiti Stream 240m above sea level. The domain is an absolute treasure and a wonderful place to explore the outdoors. Most excitingly for us, though, was the fact that a number of New Zealand’s endangered whio call this place ‘home’. All of the photos in this post are from our trip away. 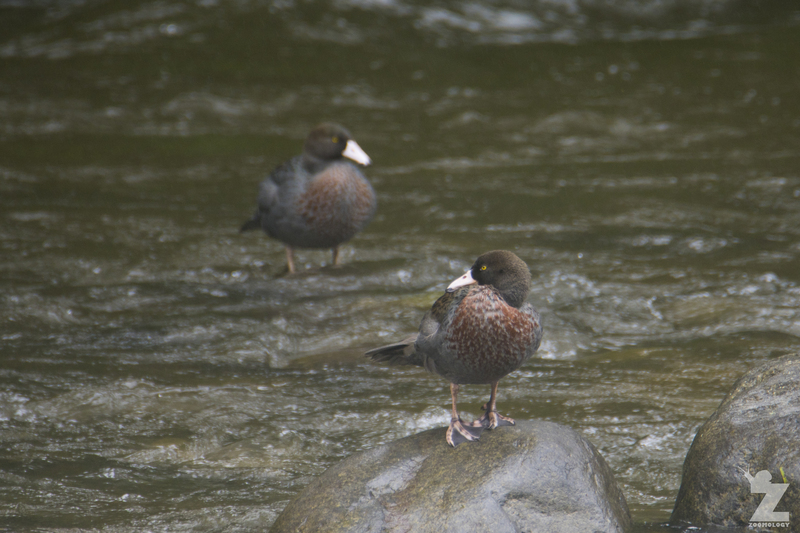 During our first sighting, we saw three whio on the river. During our second sighting the following day, we saw two. We were very happy campers! Whio, sometimes called the Blue Duck, is a species of waterfowl endemic to New Zealand. The species is the only member of its genus and has no close relatives. Their isolation in New Zealand means that they have some very unique anatomical and behavioural features. There are estimated to be less than 3,000 individuals left, making them a nationally vulnerable species which face a risk of becoming extinct. They are rarer than many species of kiwi! 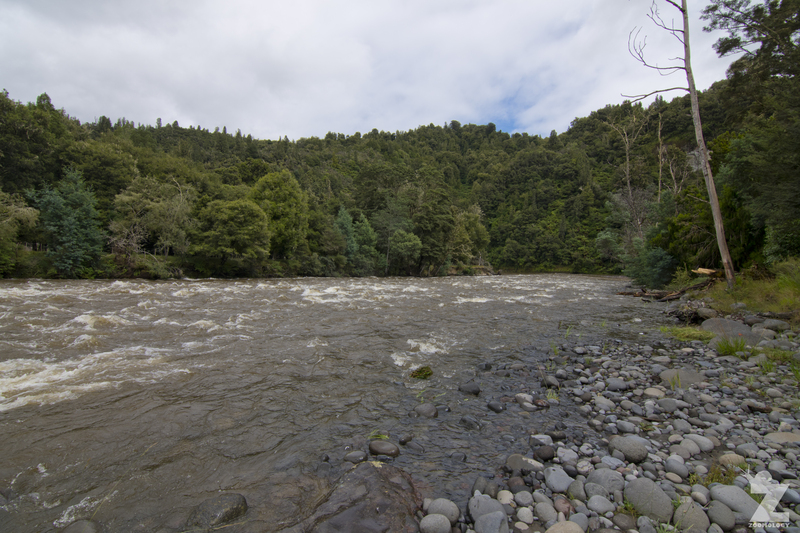 Whio need clean, fast flowing streams in the forested upper catchments of rivers, low sediment loadings, stable banks and overhead canopy cover. They nest in hollow logs, small caves and other sheltered spots. As their diet consists almost entirely of aquatic invertebrates, they require habitat with diverse invertebrate communities. Whio have a unique adaptation to aid them in feeding: They have special soft, rubbery ‘lips’ on the end of their bill that allow them to scrape insect larvae off rocks. The lips also help protect their bill from damage. They are the only duck to have this adaptation. On the rare occasion, whio will also eat berries and the fruits of shrubs. Whio are a key indicator of healthy rivers and streams. 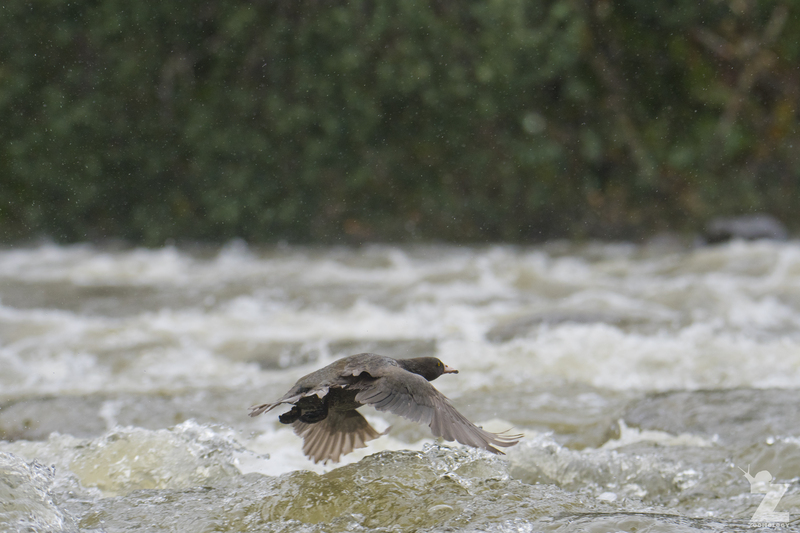 The more breeding pairs of whio, the healthier the river. 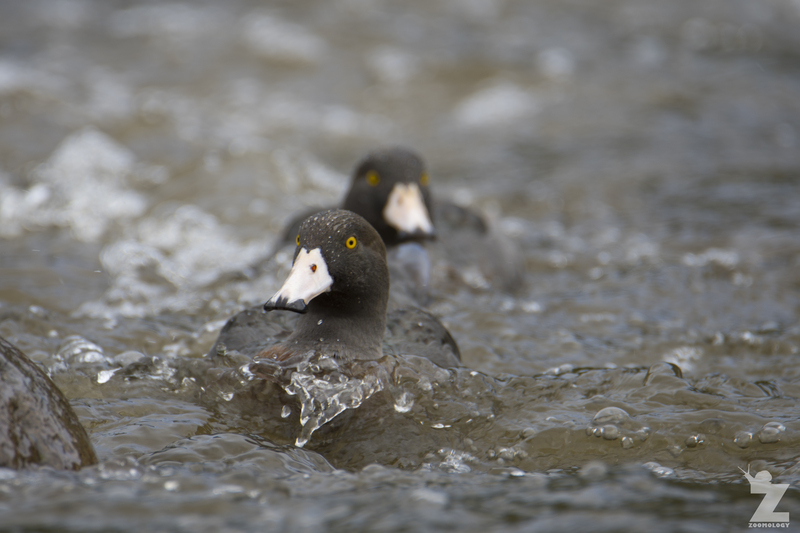 Whio are one of the few waterfowl species worldwide that live year round on fast-flowing rivers. Even whio ducklings are self-reliant and capable of battling strong currents from the moment the hatch. We loved watching them ride the waves, easily navigating the rain-swollen river with each paddle, dive and leap. Check out the photos below… just look at them go! The main threats whio face are habitat loss, predation, and disturbance. Weather events, such as flooding, also have an impact on their populations. Even on our own walks through the area, we could see that much of the water’s edge was unfenced farmland. If you recall what I wrote above about the habitat they require, you know that this ticks none of the boxes. As for predation, the main culprits are introduced stoats, feral cats, pet dogs that aren’t on a leash, ferrets, and even possums and rats. Stoats are the whio’s greatest danger as they attack females on the nest, steal eggs, and take young ducklings from the river’s edge, finding them with their great sense of smell. The time when whio are most vulnerable to attacks is during the late summer moult period when they are flightless. In Te Urewera we found 90% of nests failed in an area without predator control. Of the females, 46% were killed during the moult period when they retreated up small side stream to avoid disturbance. In the Ruahines and in Taranaki, over 60% of the fledged juveniles died in areas outside of management. From a sample of 154 whio deaths recorded between 1989-2008, 89 were linked to predators (58%), 24 natural deaths, 22 human causes, and 19 were unknown. Stoats were the cause of 79 of the 89 predator deaths. 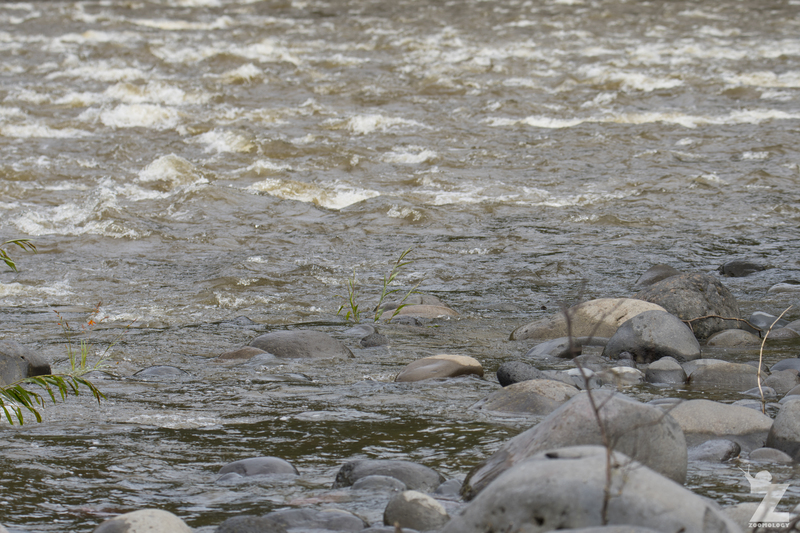 Believe it or not, there are two whio in this photo. Can you spot them? Talk about camouflage! Whio definitely know how it’s done. As a country that had no native land mammals (except for a few species of bats) until humans arrived, so many of our native species are either extinct or having a very hard time! Many of them would not be around much longer without predator control.I certainly hope we learn…! Interesting post. Here’s hoping numbers will start to build again. Thank you for bringing this to people’s attention. Kiwi get a lot of attention and everyone is aware of their plight but so many of our other critters are in danger of quietly disappearing because they lack a voice. I can’t help remembering a statement I read some years ago that 95% of fantail chicks were predated in the nest. Imagine losing the fantail. Imagine losing any more species when it’s in our power to save them. Keep up the good work. You’re right, many vulnerable species often don’t get the publicity and awareness they need – especially the ones that don’t fall in the cute+fluffy category! After all, we can only care about what we know about. “The fantail is one of the few native bird species in New Zealand that has been able to adapt to an environment greatly altered by humans. Originally a bird of open native forests and scrub, it is now also found in exotic plantation forests, in orchards and in gardens. At times, fantails may appear far from any large stands of shrubs or trees, and it has an altitudinal range that extends from sea level to the snow line. Pleased to make the acquaintance with this handsome ducks. Thank you for the introduction. I wish them well.